the friday files: Bouncy Curls - "How-To"
So before we start I would just like to mention a few things; most importantly I am not a hairdresser so I can't guarantee the results of my attempt are of any 'professional' standard. I just love doing hair and make up and this post is just a little fun, trying to mimic the curls of Chemmy Alcott which I saw on the first week of DOI. What you will need: A crocodile clip of some sort and either curling tongs or straighteners. 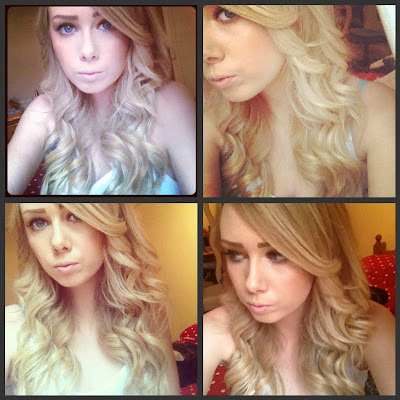 Now just to make sure, if you don't know how to curl your hair with straighteners there are load's of tutorial videos like this one: click here on YouTube that will teach you how. It's so easy! 1) First off I prepped my hair with the BODY ME volume serum whilst my hair was damp. I applied the serum to my roots to give my hair more volume as my hair is usually very flat. Then dried & straightened as normal. 2) I then separated my hair with the crocodile clip so there is a small section of hair left at the bottom of your neck like this >. 4) Continue repeating step three until all the loose hair is curled. 5) Whenever I curl my hair I usually always add in some hair extensions that match my hair colour. I do this because my hair looks very thin curled and I like the fuller curled look. If you don't have hair extensions/or need them because your hair is long enough (I'm very jealous of you) then skip this step. I would curl my extensions in exactly the same way as step three adding in each row separately when I make sections with the clip. 6) Like step two when the bottom section is finished, carry on creating small sections of hair up the head with the clip until all of your hair is curled. This shouldn't take very long if your using straighteners. Once you reach the top section of your hair and the pieces around your face, you will want to try and curl them away from your face. 8) I then added the OSiS+ Magic Finishing serum to the ends of my hair to leave them glossy and frizz free. I hope this little tutorial wasn't too confusing to read, I have to admit writing instructions is a lot harder than it looks! I'm really impressed by the products, (even though they seem a little pricey) the hairspray holds really well and doesn't feel 'tough' or 'dry' on the hair which is nice.